The two people arrested in connection with using drones to cause major disruption at Gatwick Airport have been released without charge. According to Sussex Police, officers made two arrests just after 10pm on Friday (December 21) as part of an investigation into the criminal use of drones. Police said they have been released without charge after co-operating fully with officers. More than a hundred thousand people were affected by travel chaos after the UK’s second largest airport was shut down for more than 36 hours from Wednesday evening (December 19) after multiple sightings of drones above its airfield. 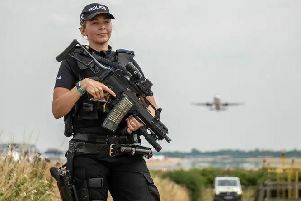 Sussex Police Detective Chief Superintendent Jason Tingley said: “Both people have fully co-operated with our enquiries and I am satisfied that they are no longer suspects in the drone incidents at Gatwick. Gatwick Airport Limited has offered a £50,000 reward through Crimestoppers, for information leading to the arrest and conviction of those responsible for the criminal act that disrupted flights. Anybody with information can contact Crimestoppers 100% anonymously on 0800 555 111 or through their anonymous online form at Crimestoppers website. Payout on the reward will be made only if the information is given to Crimestoppers first.